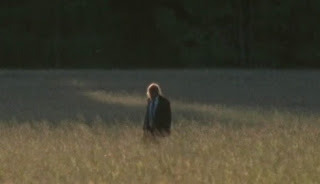 I was so excited to see this lone “walker” shambling through a field tall with grass. The evening sun casting long shadows. It was a very tranquil moment, almost a spoof of some National Geographic documentary. I’m referring to a scene from the Walking Dead TV episode, “18 Miles Out” of course. I was so excited, but even more for the “non-reaction” of our two survivors, Rick and Shane. It is unclear whether Rick ever saw the zombie, but I like to believe he did. I took driver’s ed classes so I was trained to constantly scan everything. That on top of my post-traumatic stress and I just couldn’t miss a large detail like that. But, maybe Rick is one of those “focused” drivers, or his head was full of Lori, Shane, and poopy diapers. Shane saw it all though, and it is his total, unflinching silence that I love. He doesn’t instinctively reach for a gun, or hit Ricks shoulder for attention. He just watches this zombie, like a viewer watching a lion walking across the Serengeti in a lazy rest from stalking antelope, in contemplative silence. And if ever a silence spoke volumes it was this silence. And because of this, in my mind Rick saw it and had that same non-reaction. You see, this type of scene has now happened many times in the graphic novel, or comic, or whatever term you prefer. I don’t think ‘nonchalant’ is the correct word, but in some ways it is… The lone roamer, or even a couple lurkers thrown in, 40 or 50 feet away doing whatever zombies do in their down-time has become this secondary issue for survivors. As long as a lone zombie is not at this very moment attacking, and she is “over there”, then we can get on about our business as long as we keep an eye on him. And so, I’ve been waiting patiently to see how this might come to pass in the tv show. Walk on ByA little terminology lesson for those who are just discovering the whole TWD thing. In the graphic novel (comics – also referred to as GN) the word “zombie” appears very early on. It isn’t used often but it exists. There are two types of zombies: zombies who are constantly in motion are called “roamers” and zombies who find some place to sit or lay are known as “lurkers”. The word “Walkers” does not exist in the GN. Lurkers seem to have found undeath just too tiring. You have to at least get within a couple of feet before they will even acknowledge your existence. Some you have to actually kick, and then they might find the energy to try and eat you. The two TV walkers I can point to as lurkers would be the woman in the car that Glenn wakes up (played by a really nice lady, Sonya Thompson – who has a Facebook page btw) and the lurker in the tank with Rick. These two kind of show the range for lurkers. 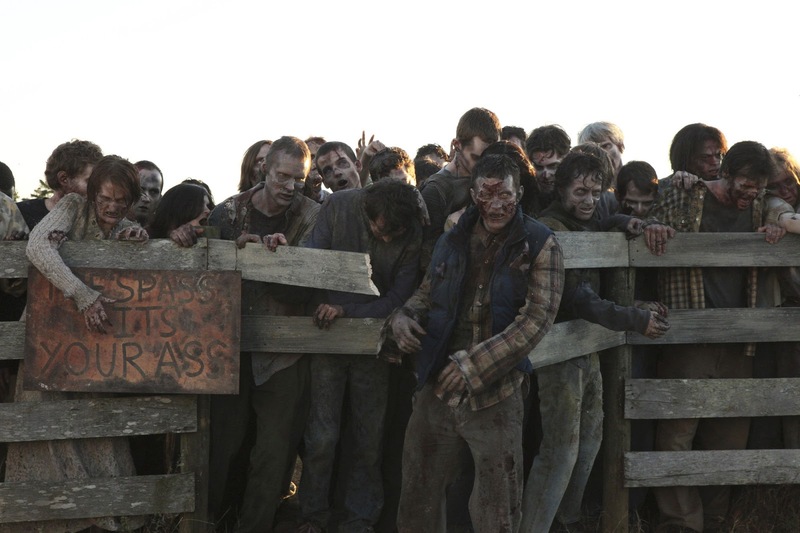 Roamers have a bit of a range also, but it never reaches the physical and mental range of the walkers on the show. As kind of a critique of the show, I have seen TWD zombies use rocks to smash windows which is a bit more tool usage than I prefer. In the show I have seen them reach speeds equal to a run. No, they did not have that classic form, and no you cannot say they were running. But you go back and watch those roamers keep up with Shane and Otis, who were running. As far as I’m concerned, even if you are jerking and shambling, if you are keeping up with someone running then you are pretty much running too. My point is this though, you are not going to get outrun by a walker in the GN. The zombies here are very much like those in George A. Romero’s ground shattering “Night of the Living Dead” and this is the way I prefer my zombies, thank you. 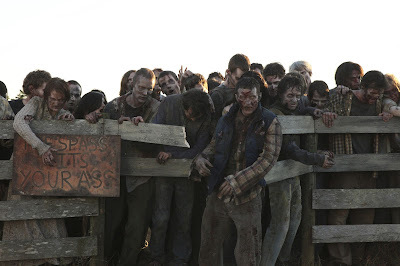 Robert Kirkman, creator of The Walking Dead, has stated in interviews and letters that the zombies are very secondary. This becomes so apparent in the graphic novels as the characters have longer interaction with them. Scenes of the lone walker in the grassy field are common. We can debate the effect of this, whether it is bad or good for a long time. And it comes down to two basic camps: Terror lovers –v- Creepy Eerie lovers. I for one prefer the eeriness, the surreal-ness, of the living moving through an undead world in an uneasy truce. “Man” always adapts… we do this with deadly spiders, and lions, and snakes around the world. Recall the extreme story of Timothy Treadwell, environmentalist/film maker, who lived with bears for 13 summers until he and his girlfriend were finally eaten. Why should the walking dead be any different? I was heartened to here Glenn saying how he had forgotten how dangerous they were, that it’s all become another round of Portal. With that “comfort” comes new dangers to the survivors as Kirkman examines how we humans just cannot help ourselves. We HAVE to find some comfort level, some radical acceptance, of the world around us or we go mad. Hence, my personal preference for the creepy-surreal over the constant horror/terror. Walking Dead comic "yeah..they do"I think, in closing, that there is a hidden seed of hope (or the need for that seed of hope) in Kirkman’s vision. He wants us to see the zombies as merely the earthquake, tsunami, or sinking ship. But these are all events with which we must merely endure, find a way to survive. There is no cutting the head off an earthquake, no sticking a screwdriver in the eye of a hurricane; we can only seek shelter. Intentionally or unintentionally, The Walking Dead exposes that need for the human to fight back. With knives and guns we fought to keep bears and lions from eating us. With tools and shelters we fight the weather from freezing us or cooking us. With all of our arts and sciences we fight an uncaring universe for our right to breath. And through the lens of a silly little comic and tv show I can see that “we” would only find a zombie apocalypse a speed bump and nothing more. We would eventually watch a roamer stumble through the sunlit field with as much excitement as we watch cows chew their cud. In this we are not the Walking Dead.